Hostella i Rom, Italien : Boka nu! 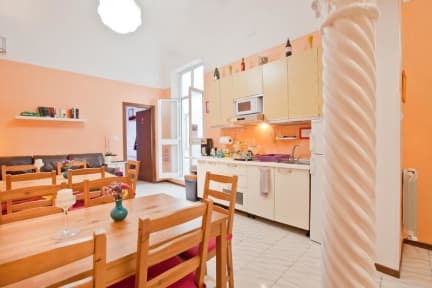 We are located on the first floor of a residential 19th century building, surrounded by restaurants, supermarkets and laundromats, few minutes walk from the main station Termini and not far from the main tourist attractions. In our cosy guesthouse you can truly feel at home: enjoy the comfort of cooking your own meals in our spacious and colourful kitchen, sit on the couch and watch TV or read in our common area , chat with the other guests. 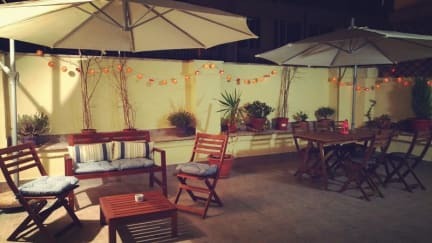 The nicely decorated terrace is the perfect place to put your feet up and relax with a glass of wine or a cup of tea.